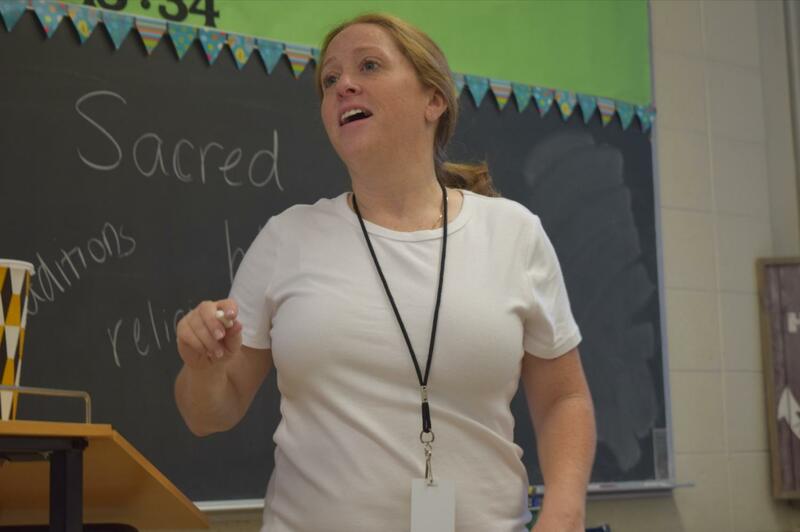 Mrs. Andrea Kowalyk teaches her freshmen Intro to Theology class the importance of scripture and how it can impact their lives. Photo by Dunya Kizy. Laughter fills Mercy religion teacher Mrs. Andrea Kowalyk’s office as girls buzz about upcoming assignments, the stressful week ahead, and seemingly endless friendship drama. Mrs. Kowalyk helps them the best way she knows how, through God. With every aspect of her life, she tries her best to incorporate God, and she wants to help Mercy girls find God in their own lives. She no longer does this as a campus minister, but now as a Religious Studies teacher. Mrs. Kowalyk’s classes include sophomore Bible class, junior and senior Christian Traditions, and freshman Intro to Theology. She said there is a difference between teaching students how to understand God and teaching students how to love God. As an educator and role model, it is her goal to accomplish both in the classroom. Ever since childhood, Mrs. Kowalyk has been immersed in her faith. From her parents pushing her to attend mass, despite her protests, she learned the importance of having God in her daily life. “It is a big part of my life and when I was a campus minister, my job was to be the person to bring God into the students’ lives the way my parents did for me,” said Mrs. Kowalyk. Her overall goal for this year is to show students where they stand in their faith. She hopes to illustrate not only the helpful and beneficial side of faith, but the relatable side of the church.